Hi all! I have a quick and fun project to share today. 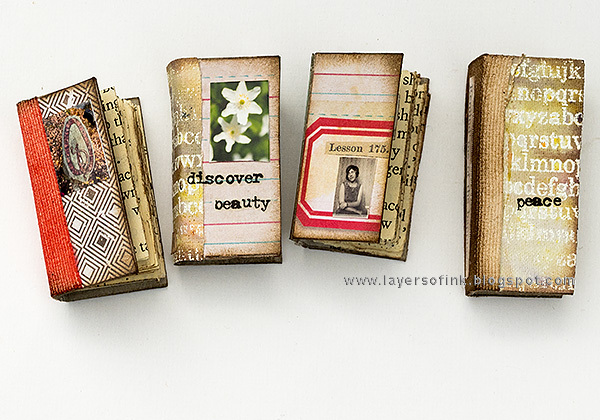 The Eileen Hull Inspiration Team has been sharing unexpected ways of using Eileen's Sizzix products this month. 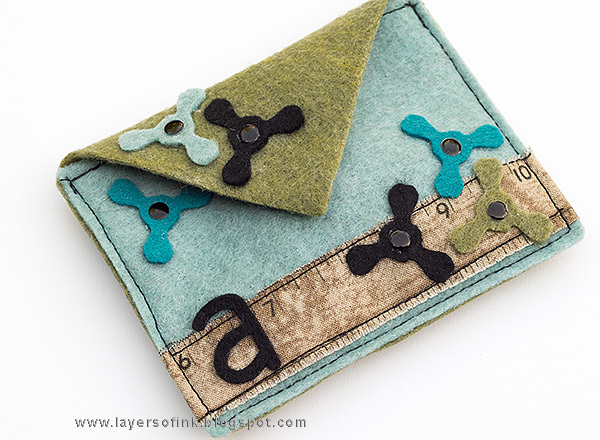 I love to use my dies in ways they weren't originally meant to be used and had such fun with this project. 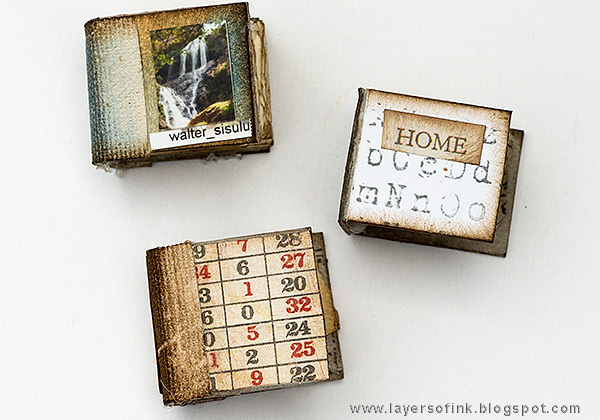 It is is also a great way to get even more use out of your dies. The fidget spinner craze reached our house at the beginning of the summer and Anton loves his spinners. 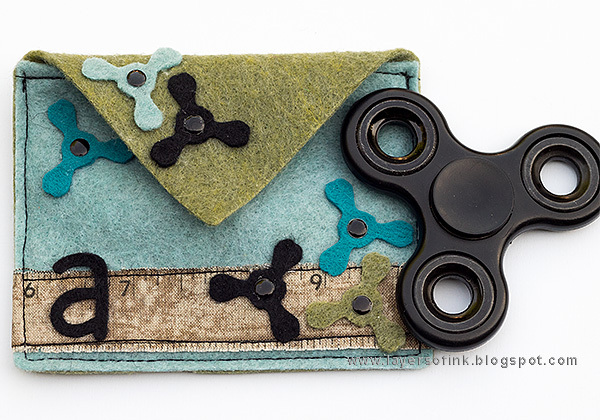 As I was looking at the House Pocket die from the Heartfelt collection, I got the idea of turning it into a little bag and it was just the right size as a case for a fidget spinner. It is very easy to make this bag out of felt, but you can also try other materials. Even the little fidget spinners were made with a die, as you will see below. 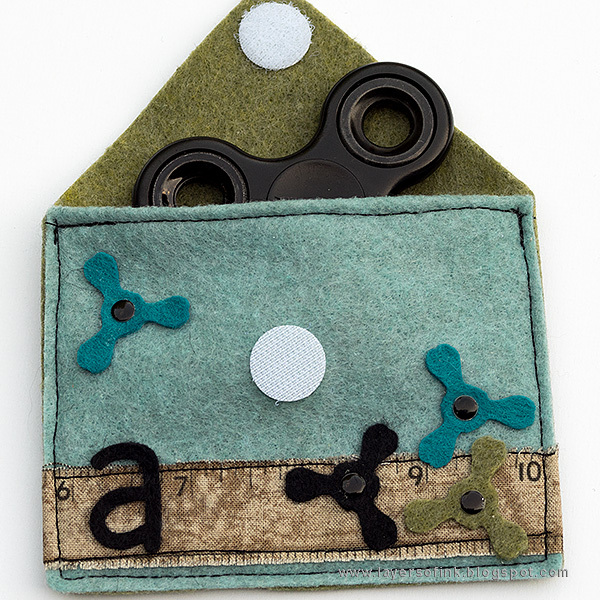 Now, Anton can keep a spinner in his backpack or pocket without worrying about it getting scratched. Lots of other things could be stored in this little bag too, and you can use it as a little gift bag. It would be perfect, for instance, for a necklace or another small gift. Or for a gift card. The bag is 4.3 x 3.3 in. Let's start with the simple steps for how to make this fidget spinner case. 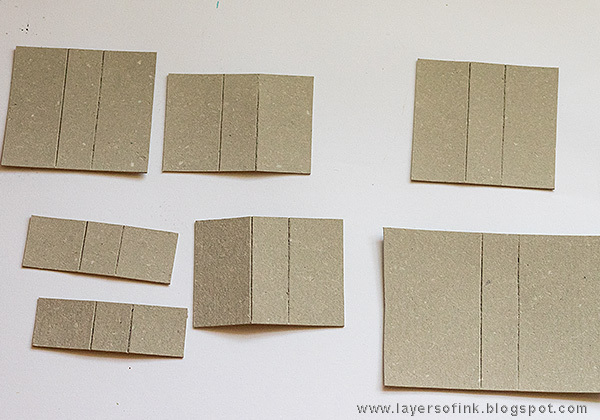 Start by die cutting one full house shape and one shorter shape from thick felt. I used felt by Kunin. Leave a little flap at the top of the blue shape. 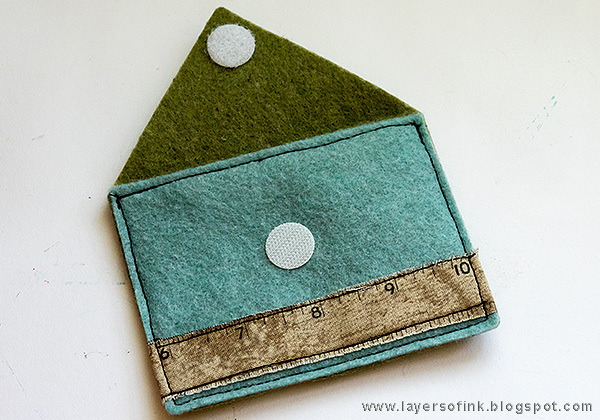 Fold down the flap and stitch. You can match up the thread if you want to, but I decided to go with contrasting black. 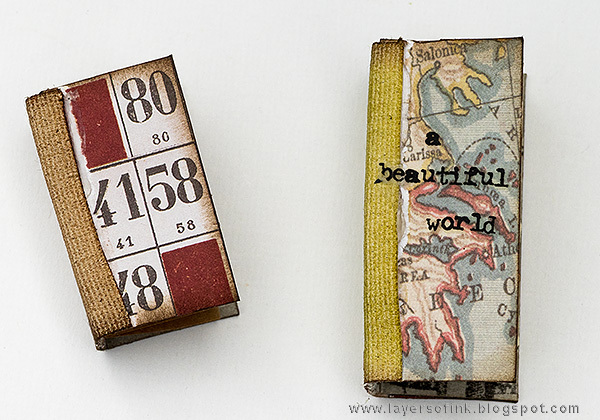 I also glued a ruler cut from Tim Holtz's Eclectic Elements fabric and stitched that down too (when the glue was dry). 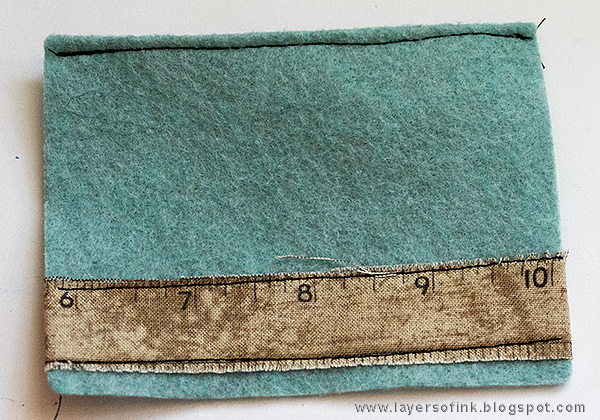 Place the blue square on top of the house shape and stitch around the edges. Add Velcro for a closure. 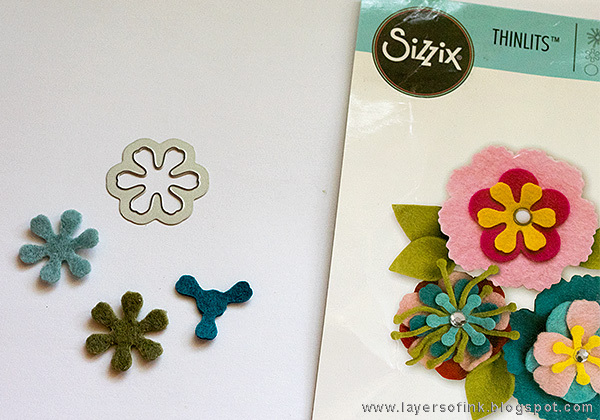 I was wondering how to embellish the bag, and when I looked at the flowers in Eileen Stitchy Flowers & Leaf set, I realized that one of them could easily be turned into a fidget spinner, by simply cutting off every second petal. 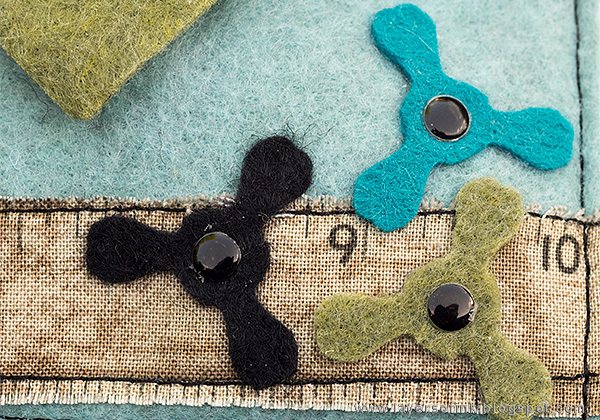 Glue the spinners to the bag with matte medium and add a gem to the center. 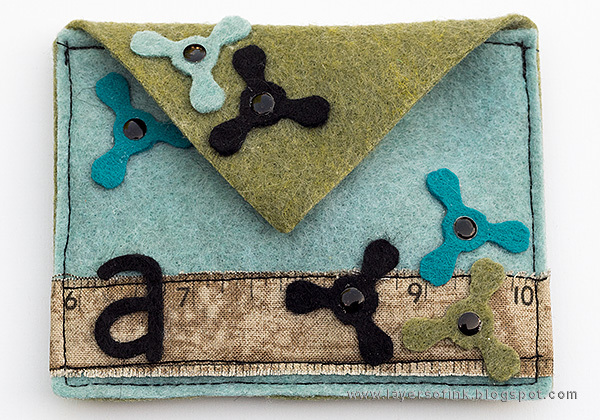 The black and teal felt is wool felt by Simon Says Stamp. 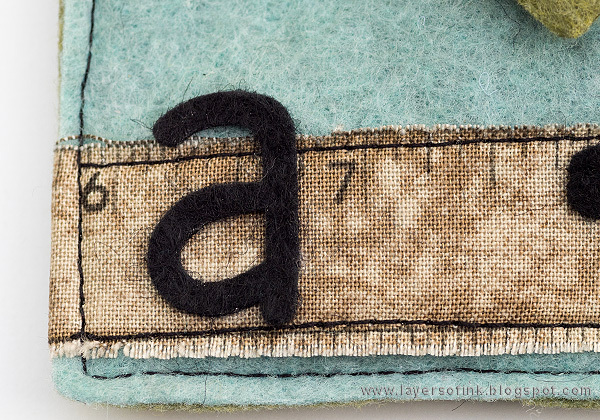 I also die cut the first letter of his name from black felt, using Eileen's Homemade Alphabet die. You could of course also die cut the recipient's full name. Anton likes his little bag and already has ideas for more bags. Instead of decorating with fidget spinners, you can use the full flower, or maybe a bird or a butterfly, from Eileen's Birds & Butterfly set. 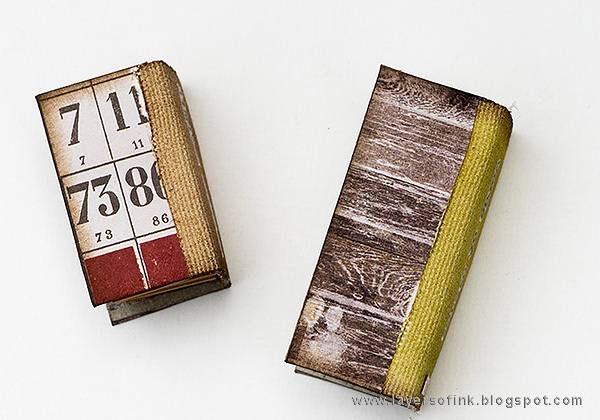 For a more traditional use of the House Pocket die, check out this House card of mine. 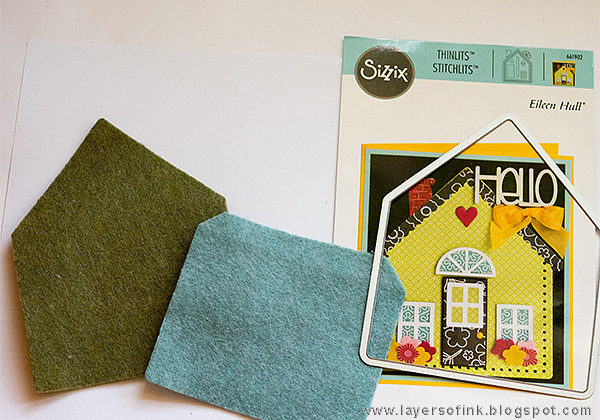 There is still time to join Sizzix Eileen Hull Maker Challenge, focusing on the House Pocket die. I hope this post inspired you to look at your dies with new eyes, since most dies can be used for so much more than what you see on the packaging. Hello friends! I hope you had a fun weekend! We had a great time visiting friends at a lake yesterday and the boys loved going for a boat ride and fishing. 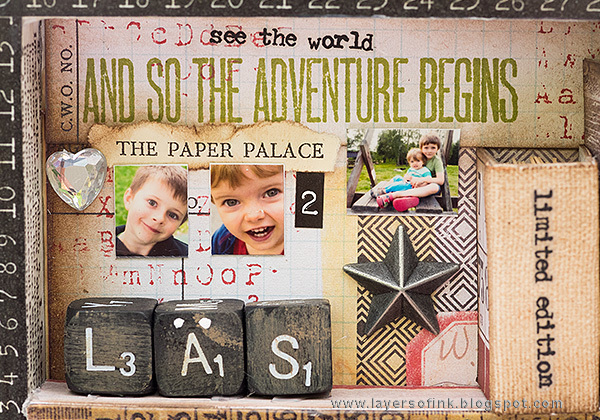 This week at the Simon Says Stamp Monday Challenge Blog we have a School or Study theme. I hope you will join us in this fun challenge, and don't miss the last contribution of our August guest designer Simo from Ginny and the Sheep. There is still time to join the Simon Says Stamp Kid's Summer challenge - Anything Goes with Glitter. You can find Anton's Glittery Cactus here. I have had the idea of making a miniature bookshelf in my head for quite some time and since it fit this challenge so well, I finally decided to do it. 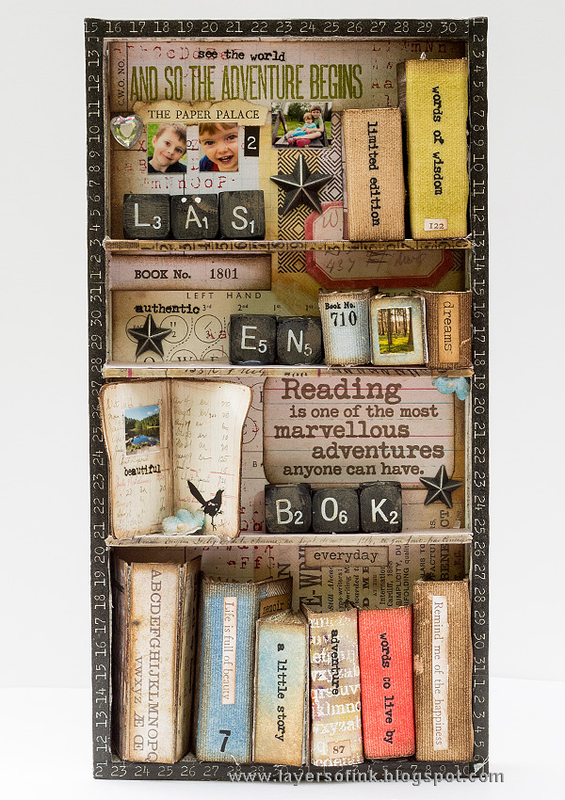 As you might know, I love to read and I think that reading is very important, especially for kids, and I had such fun making this bookshelf and all those miniature books. 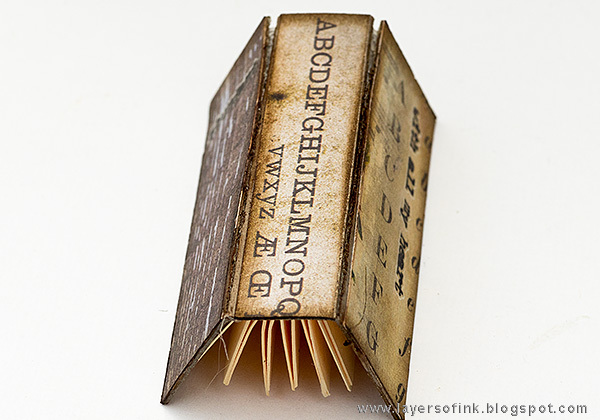 The words spelled out with alpha dice translate 'read a book'. I took some step photos along the way. 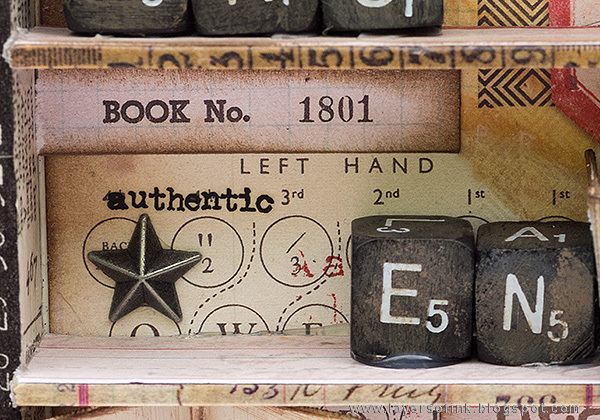 As my base I used a Tim Holtz Vignette Tray and cut up a Baseboard to fit perfectly as shelf. 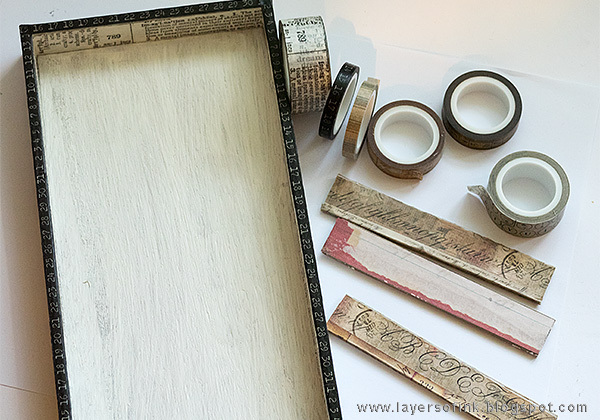 The tray was coated with gesso and I covered the sides of the tray and the shelves with strips of paper as well as design tape. Add some matte medium first to make sure the tape sticks down well. 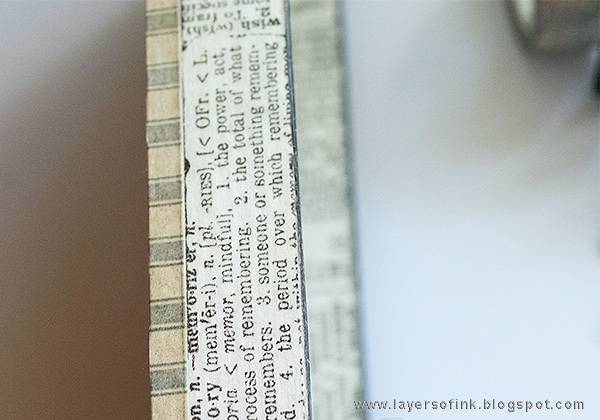 The side of the book shelf looks like this, very quick as easy with tape. 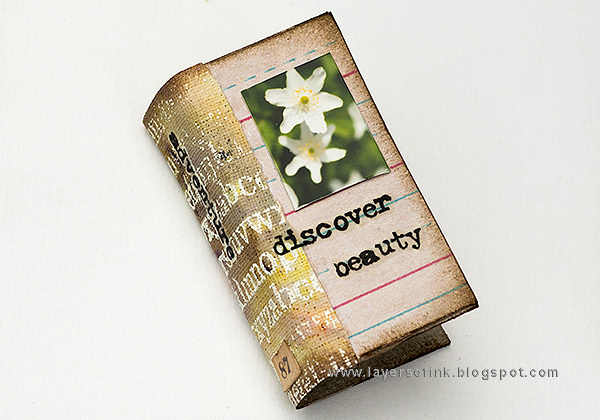 For the inside I used patterned paper and stamped it with my favourite alphabet stamp as well as a sentiment. The edges were inked with Ground Espresso. 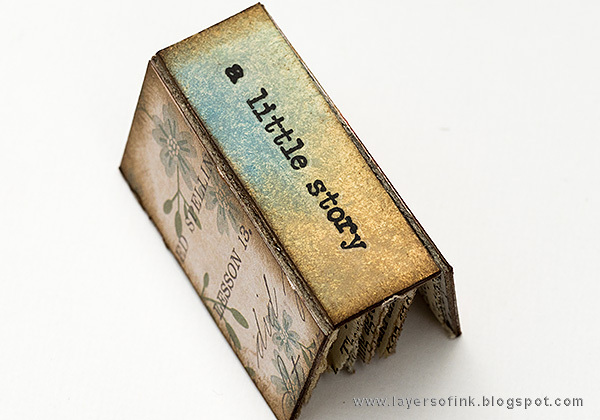 The books were made using Tim's Matchbox die and grungepaper. 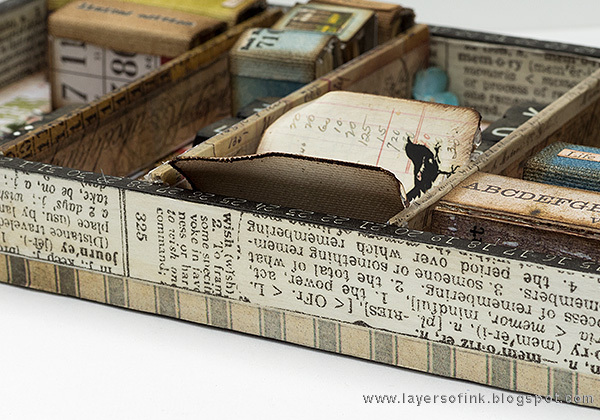 Die cut book and then cut the top and sides so that you have a variety of sizes. 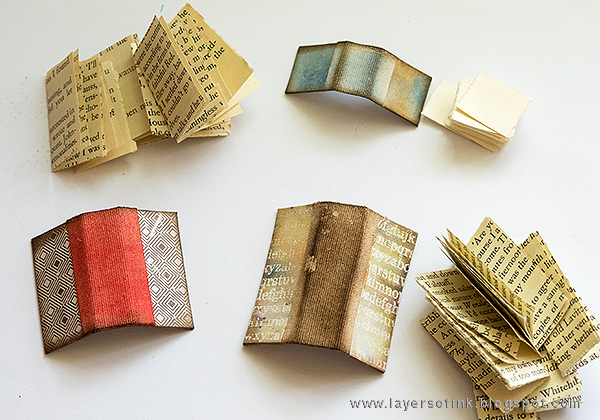 Cover the books with scraps of patterned papers. 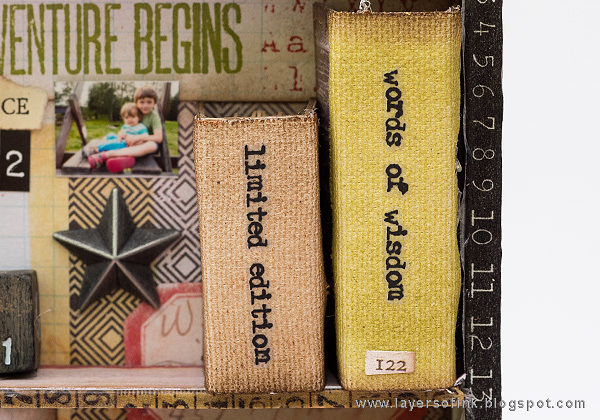 For the spine, I used Sticky-back Canvas for most of the books, and strips of paper for a couple. 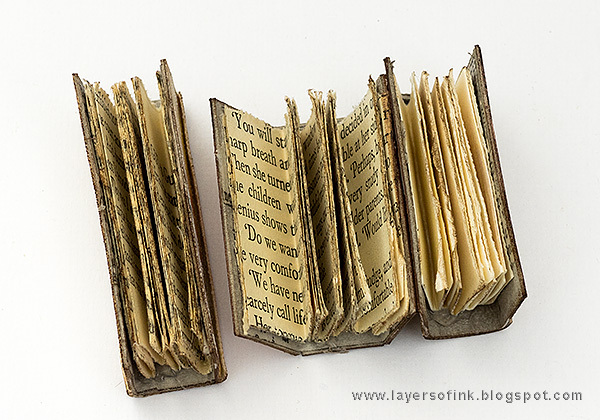 The insides were done with scraps of book paper, as well as small pieces of cream and manila cardstock. I used hot glue to attach the pages to the book (be very careful not to burn yourself). 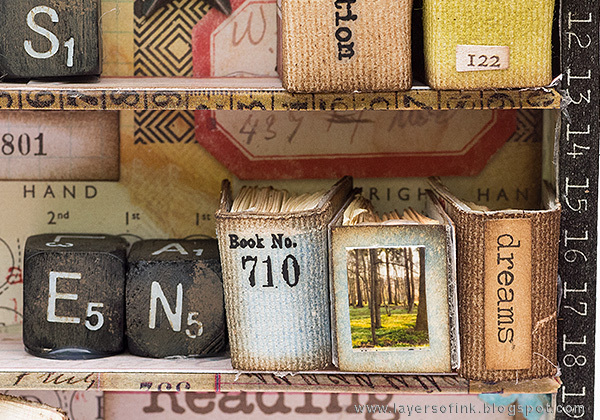 The bookshelf was decorated with tiny photos from sample sheets I got the last time I had photos printed. 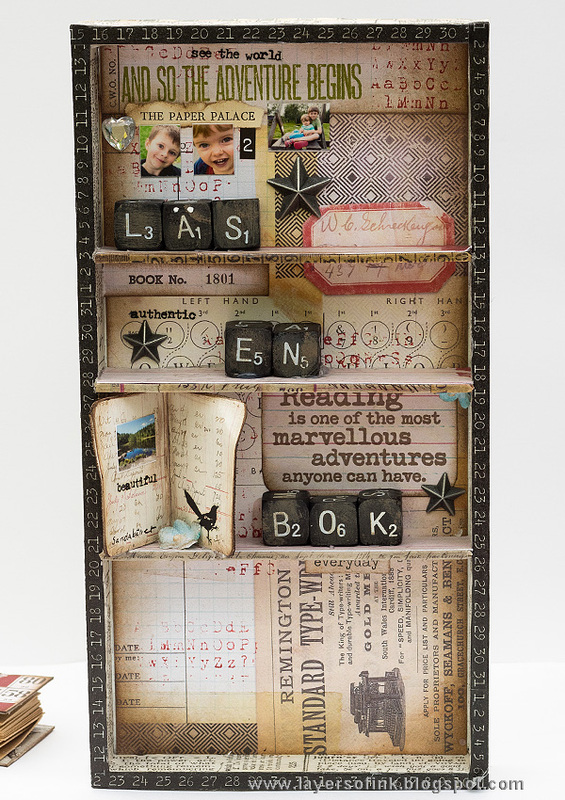 I also added rub-on sentiments, a mirrored heart, metallic stars and number stickers. 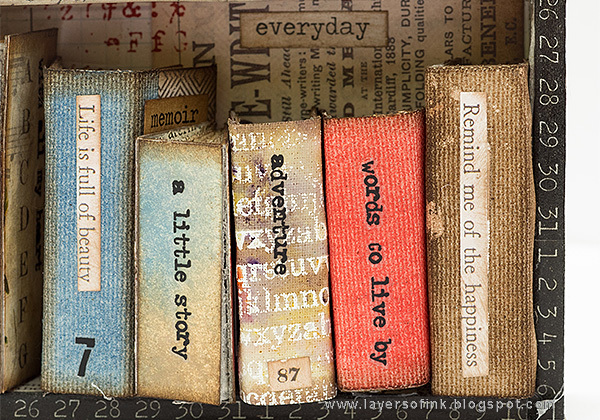 The books were decorated with rub-on words and Clippings Stickers. I used these alpha dices also as bookends. 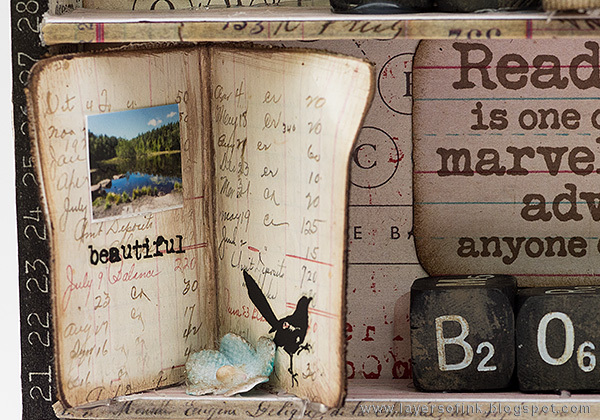 I love this quote from the Darkroom Door Bookworm set. These three books are pretty tiny. None of the books were glued to the shelf. 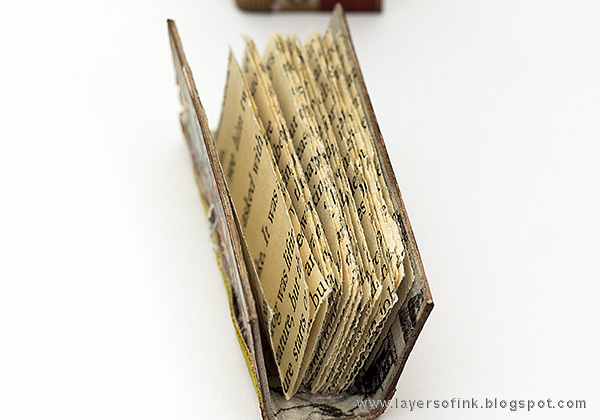 I also used an ephemera notebook piece, and covered it with canvas at the book. A photo, rub-ons and a flower was added to it. The bottom shelf was used for books only. I had fun picking the sentiments for the books. 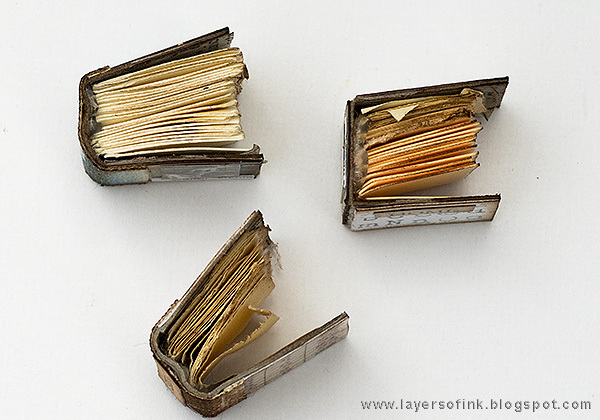 These are the three tiny books from the top. 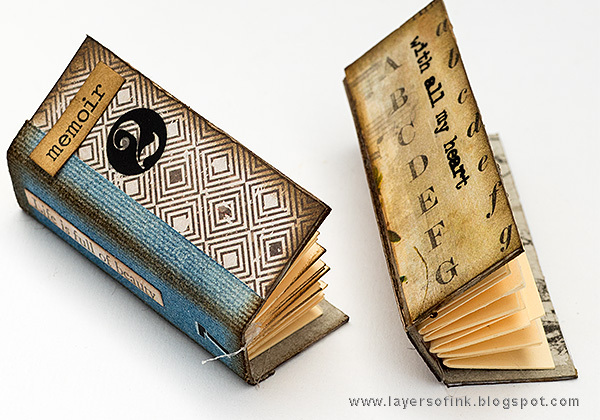 The tiny books looks like this on the front. I picked papers that featured numbers, words and maps, to fit with the theme of learning. The back of the books are covered too. The spines were inked with Distress Inks. 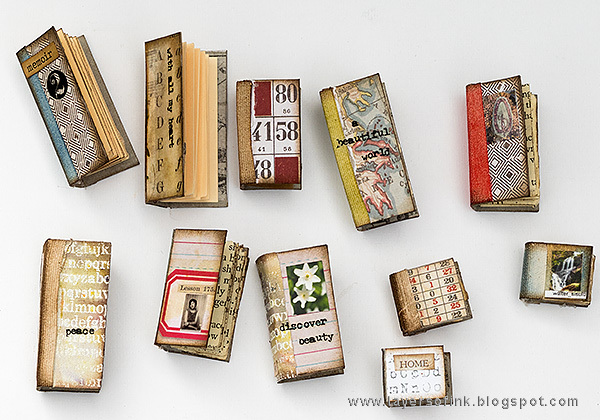 More little books. I had such fun making these. 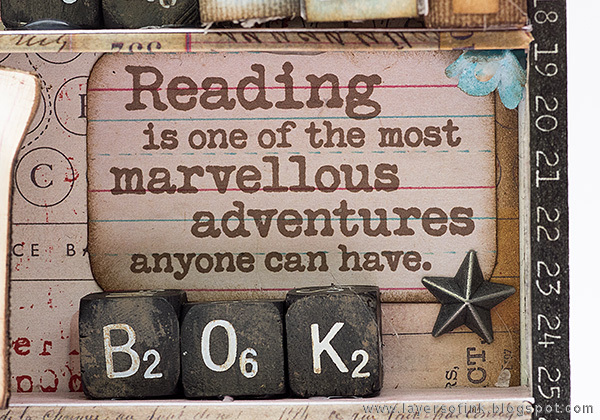 There are also books on history and nature. 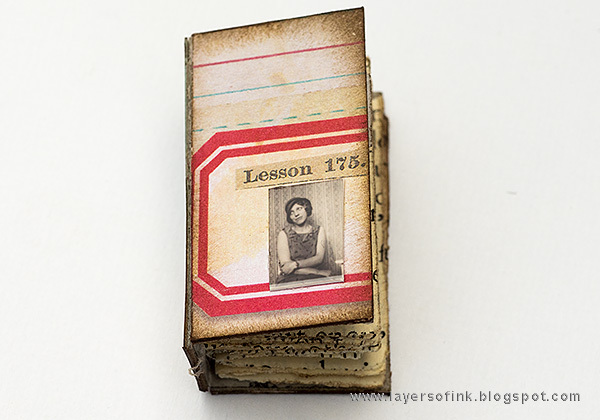 On this book, I used a tiny photo of my grandmother. The title of the book above. 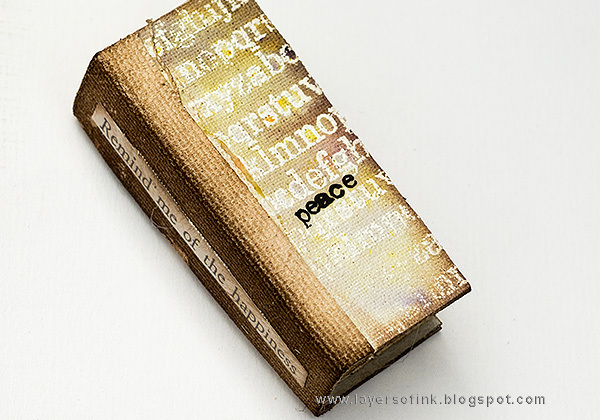 I really like the sentiment on the spine of this book. 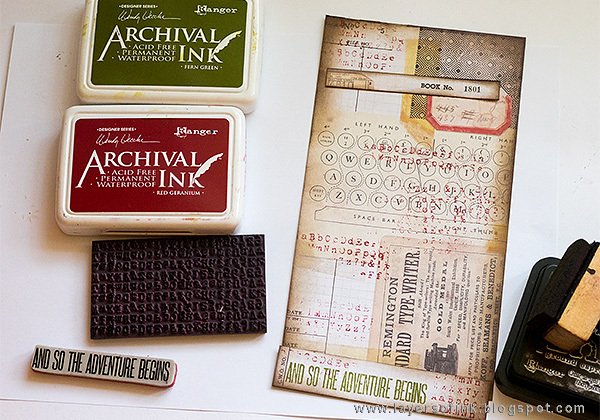 And the ABC comes from the SSS Tiny Alphabet stamp. A little book about flowers. I added design tape on the inside of some of the books too. 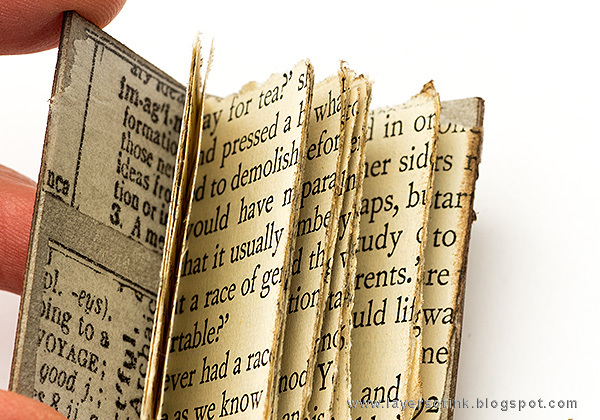 The pages were torn for a distressed look. 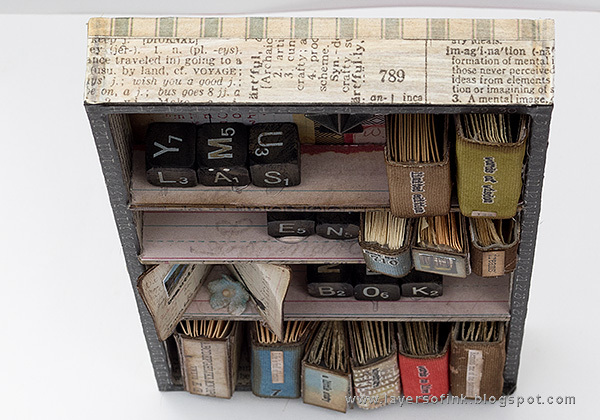 And here you can see all the little books. Another view of the dimension of the shelf. The books were made so that they only stick out a tiny bit from the bookshelf. You can also make them a little larger, if you want to. When the books are removed, the shelf looks like this. I hope you will join us this week in our School or Study challenge. As always, you have a chance to win a $50 gift voucher to do some fun shopping at Simon Says Stamp. You have until Monday 8am Ohio time. 1pm UK time, 2 pm CET to join in.